Amelia Earhart disappeared on July 2, 1937, while attempting to become the first woman to fly around the world. Eighty years later, the search for clues to her fate still continues. Bone-sniffing canines have been searching a remote Pacific island for any signs of the famous, ill-fated pilot. Here's what they found. Four bone-sniffing dogs that were brought to this remote Pacific island to search for traces of Amelia Earhart have identified a spot where the pioneering aviator may have died 80 years ago. TIGHAR researchers had previously visited the island and narrowed their search to a clearing they call the Seven Site due to its shape. In 1940, a British official visited the site and reported finding human bones beneath a ren, or tournefortia, tree. In 2001 searchers located what they believe is the ren tree site, and subsequent excavations unearthed possible signs of an American castaway, including the remains of several campfires, and U.S.-made items such as a jackknife, a woman’s compact, a zipper pull, and glass jars. Earhart and her navigator, Fred Noonan, disappeared on July 2, 1937, on their way to Howland Island—350 nautical miles northeast of Nikumaroro along the line of position that Earhart outlined in her last confirmed radio transmission. TIGHAR’s hypothesis is that, when the aviators couldn’t find Howland, they landed on Nikumaroro’s reef during low tide. Proponents of competing theories argue that Earhart’s plane crashed and sank into the ocean, or that she ended up in the hands of the Japanese in the Marshall Islands or on Saipan. Indeed, a new documentary from the History Channel resurfaces a photograph that purports to show Earhart and Noonan in the Marshalls some years after they disappeared. But the man’s face is indistinct, and the woman’s back is to the camera. “Extraordinary claims require extraordinary proof, like a bone or DNA” said Andrew McKenna, who has participated in several TIGHAR expeditions to Nikumaroro. The forensic dogs were brought to the island in hopes of finding that proof. Forensic dog Kayle sits on a spot where she detects the lingering scent of human bones that may have decomposed long ago. Archaeologist Dawn Johnson and physician Kim Zimmerman collect soil samples for analysis at a DNA lab. The signals were clear: Someone—perhaps Earhart or her navigator, Fred Noonan—had died beneath the ren tree. But the discovery made by the dogs—which can detect the lingering scent of human bones long after the bones themselves have decomposed—was no guarantee that the expedition’s archaeologists would unearth any visible traces of the person who died under the tree. The excavation began in earnest on July 2—the 80th anniversary of Earhart’s disappearance. The expedition was scheduled to depart the island on July 6. By the second to last day, the team still hadn’t located any bones. Tom King, TIGHAR’s senior archaeologist, began considering backup plans. The first: Send soil samples from the site to a lab capable of extracting DNA. Earhart and navigator Fred Noonan consult a map of the Pacific that shows the planned route of their flight. Fred Hiebert, National Geographic’s archaeologist-in-residence, pointed out that Neanderthal DNA has been successfully extracted from soil dug from a French cave. 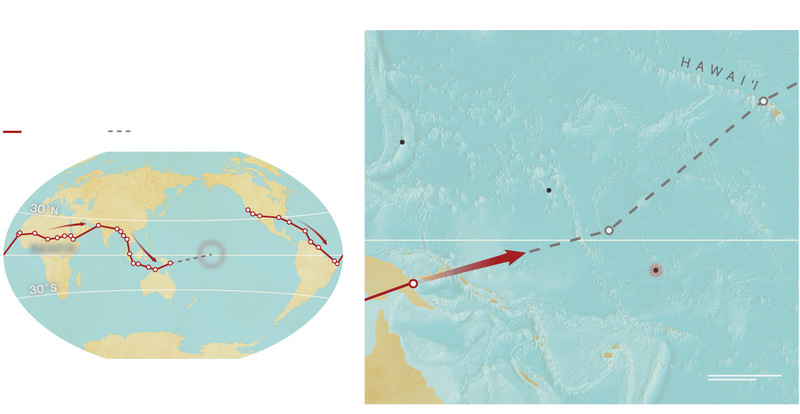 But he acknowledged that the odds of securing DNA from a tropical environment like Nikumaroro are very long. King’s other plan was to pursue a “weird story,” as he put it, that the bones found in 1940 somehow ended up in a post office on Tarawa, Kiribati’s capital. On the last day on the island, archaeologist Dawn Johnson and physician Kim Zimmerman donned surgical masks and gloves and filled five Ziploc bags with soil from around the ren tree. Arrangements were being made to send the samples to a DNA lab in Germany. Perhaps in the coming weeks scientists there will confirm beyond all doubt that Amelia Earhart died a castaway on Nikumaroro. But as the ship steamed away from the island, plans were also being hatched to send a team to Tarawa. Maybe that’s where Amelia Earhart’s bones have been hiding all along. Or maybe not. But that doesn’t stop him—and many others like him—from continuing the search.